This writeup covers Ultra-Boy’s first few appearances (Superboy #98 (July 1962), Adventure Comics #300 (September 1962), Adventure Comics #302 (November 1962), and Adventure Comics #304 (January 1963)). Back then the only power he displayed was “Penetra-Vision” (his term for multiple abilities including X-Ray Vision, Heat Vision, and Telescopic Vision). Later origin stories for Ultra-Boy gloss over or outright retcon away this period, presenting him as if he had all of his one-at-a-time-Superboy powers from the beginning of his career. I generally agree with that approach, but I still thought a writeup of Ultra-Boy from that little known early period would be interesting. These are 4 of Ultra-Boy’s first 5 appearances. 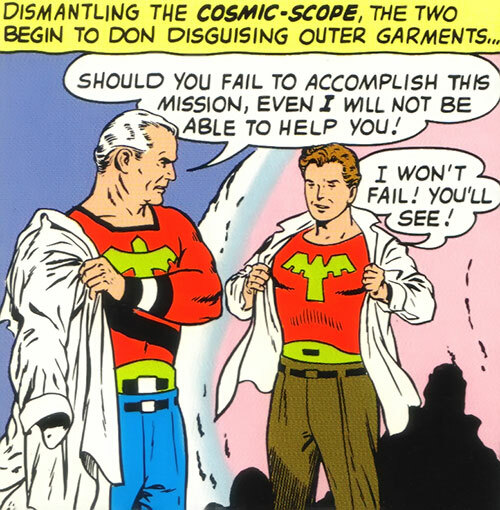 Along with his appearance in Superboy #100 (October 1962), they are the only ones I know of that show this version of him, where he possessed only his vision powers. By his next appearance (Adventure 314, November 1963), Ultra-Boy, Superboy, and Mon-El are listed as the three mightiest Legionnaires. Most of his powers aren’t clearly portrayed in that story, but superstrength, superspeed, and invulnerability to all but certain forms of radiation are all implied. In his next appearance (Adventure 316, January 1964), his origin is retold. He shows his full powers and the one-power-at-a-time Limitation is first established. Those two stories are collected in Legion Archives vol. 2, as will be mentioned in the next Ultra Boy profile. In his first appearance, Ultra-Boy’s superhero name and his real name are both hyphenated (“Ultra-Boy” and “Jo-Nah”). They hyphen stays consistent throughout the period covered by this writeup. It begins to become inconsistent beginning with Adventure Comics #309 (June 1963), and is finally completely dropped with Adventure Comics #316 (January 1964). Group Affiliation: Legion of Super-Heroes. Base Of Operations: Legion HQ. Height: 5’10”? Weight: 170 lbs.? Project heat from his eyes. See things from far away. This ’power‘ of Penetra-Vision is, in DC Heroes Roleplaying Games terminology, actually several Powers. He demonstrates X-Ray Vision, Telescopic Vision, and Heat Vision/Laser Beam. Before long he would start distinguishing between his Penetra-Vision, which could help him see through objects even from far away, and his ability to project heat, which he would start calling flash vision. ”Flash Vision” was first used in Adventure Comics #300, in September 1962. Ultra-Boy’s Penetra-Vision is superior to Kryptonian x-ray vision. He can see through lead and anything else he’s ever encountered. Eventually he’ll learn that he can’t see through inertron, which hasn’t yet been invented in the period covered by this profile. In DCH terms this isn’t a true Limitation to his X-Ray Vision. It’s just that inertron has a high BODY of 30-35, greater than his APs of X-Ray Vision. I’ve set the AP level high enough that he could see through the 20th century’s inertron-equivalent, which is Promethium at Body 20. At GM discretion you might increase his vision powers a bit if you think he ought to be able to see through super-alloys from other settings, like uru or adamantium . Ultra-Boy has used his Penetra-Vision to spot signs of nervousness and agitation by seeing a person’s heart start beating rapidly. In DCH RPG terms, this is Empathy. 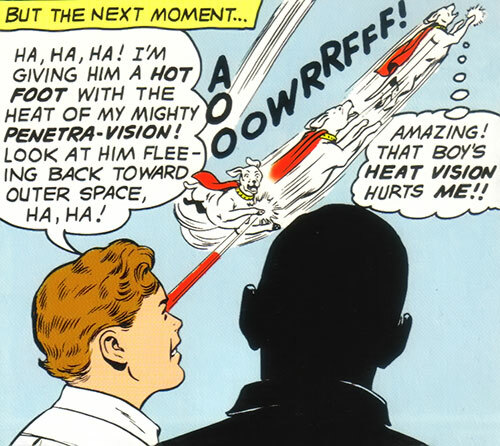 Ultra-Boy’s heat vision, or “Flash Vision”, is also more powerful than Superboy’s. For one thing it has the “amazing” ability to melt lead. Kryptonian heat vision often couldn’t do this during the early Silver Age, as the heat vision was sometimes explained as ’the heat of Superman’s x-ray eyes’. That particular Limitation was unevenly applied in Superman and Superboy stories and was eventually dropped entirely. But at the time covered by this profile it was part of what made Ultra-Boy “superior” to Superboy. 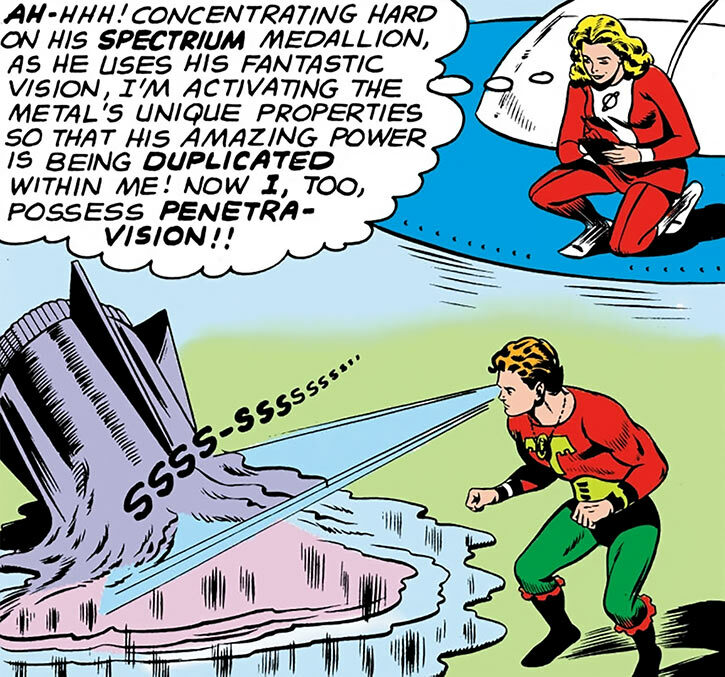 Even apart from this consideration, Ultra-Boy’s flash vision is more powerful than Kryptonian heat vision. It takes the combined heat vision of Superman, Supergirl, and Krypto just to trim a Kryptonian’s invulnerable beard and hair, much less do actual harm. But it only takes a light dose of flash vision to burn Krypto the Super-Dog and drive him off yelping. 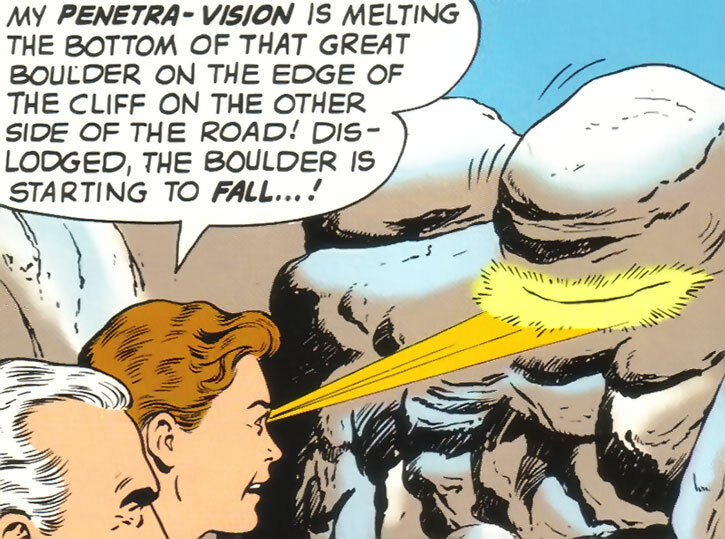 Ultra-Boy’s equivalent of heat vision is colored blue in the comics, meant to signal that it’s a bluer, hotter beam than Superboy’s red or yellow heat vision. Ultra-Boy can also see objects from far away, and can combine this with his ability to see through objects. I’ve assumed that, as was common for Silver Age Kryptonians and Daxamites, his telescopic vision is powerful enough that he can look at planets in nearby solar systems. He does demonstrate that ability in stories set immediately after this period. In the stories in this period, Ultra-Boy only uses his telescopic vision from a few miles away, so strictly speaking only Telescopic Vision: 12 is verified. Ultra-Boy doesn’t demonstrate Microscopic Vision during this period. In one later story he’s able to see and identify fingerprints left on objects. He probably has 10 or 15 APs of Microscopic Vision. Based on Kryptonian vision powers, he likely also can see in the dark. That would be covered by 10 or 15 APs of Ultra Vision, appropriately enough. Like any good Silver Age science fiction hero, Ultra-Boy is comfortable with technology. He can pilot a time globe or a spaceship, repair malfunctioning Superboy robots, and draw sophisticated diagrams of the inner workings of mechanical devices. 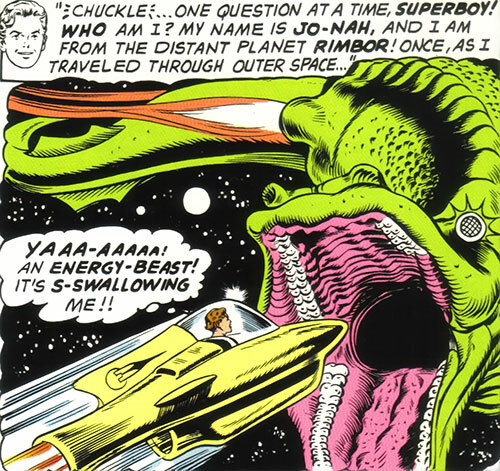 Born Jo Nah of the distant planet Rimbor in the 30th century, he gained the amazing power of Penetra-Vision when an ultra-energy beast swallowed his space vehicle. He was quickly rescued by the Galactic Patrol (likely an alternate name for the Science Police), but the radiation from the beast had lingering effects. He gained super-powered eyes that could see through objects, see far away, and project intense heat. Using his newfound abilities on behalf of the law, he began to earn a reputation as a superhero called Ultra-Boy. The young hero decided to travel to the planet Earth, where he was a relatively early applicant to the Legion of Super-Heroes. Ultra-Boy was a ’relatively‘ early applicant to the LSH, but there’s some controversy about just how early. 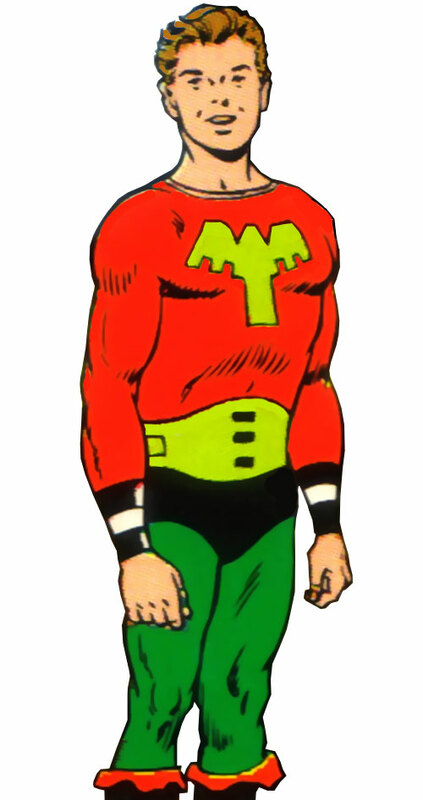 He was the 14th Legionnaire to appear in a story (16th counting Superboy and Supergirl), after Cosmic Boy, Saturn Girl, Lightning Lad, Triplicate Girl, Phantom Girl, Chameleon Boy, Colossal Boy, Invisible Kid, Superboy, Star Boy, Supergirl, Brainiac 5, Sun Boy, Shrinking Violet, and Bouncing Boy. 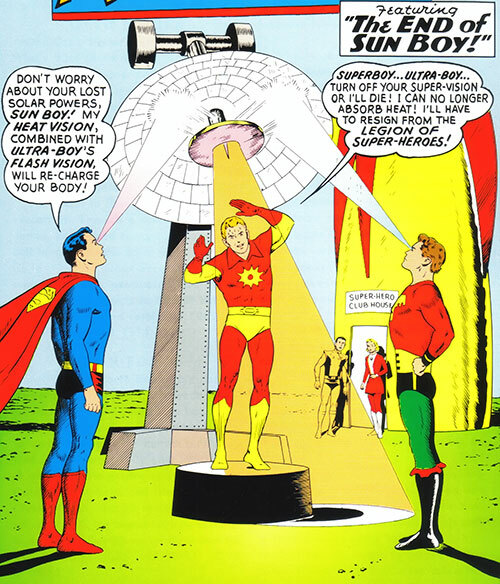 However, post-Silver Age stories which detail the history of the Legion indicate that Ultra-Boy was actually the 12th Legionnaire, after Cosmic Boy, Saturn Girl, Lightning Lad, Triplicate Girl, Phantom Girl, Chameleon Boy, Colossal Boy, Invisible Kid, Supergirl, Brainiac 5, and Superboy, but before Star Boy, Sun Boy, Shrinking Violet, or Bouncing Boy. That’s generally been the official position of DC ever since. The discrepancy gets explained either as a publishing issue (early stories were not necessarily published in the order they “happened”) or a result of time travel (early Legion stories were usually from Superboy or Supergirl’s point of view, and early on they may have interacted with Legionnaires from slightly different periods). Ultra-Boy could be assumed to be away on missions, or otherwise absent, during many of Superboy and Supergirl’s visits. Similar discrepancies exist with other early Legionnaires. 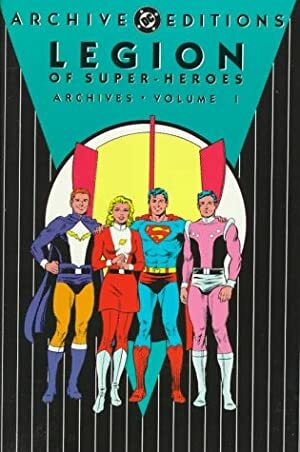 For instance, the first Legion story was Superboy’s joining the team, but many Legion fans (and DC’s official histories) believe that Supergirl joined the Legion first. As an initiation test, Ultra-Boy was sent through the time barrier to 20th century Smallville. He was tasked with discovering Superboy’s secret identity within 3 days. Marla, the Legion’s new adult advisor, accompanied him as an official observer. (Most of the early Legionnaires seem to have already known Superboy’s secret identity and to idolize him. Possibly the Legion wanted to make sure that their new prospect learned all about their idol before he could be found worthy of membership). To avoid attracting attention from Superboy, the pair hid their time bubble near Metropolis. They dressed as ordinary 20th century persons, and traveled to Smallville by train. Assuming correctly that Superboy probably attended Smallville High School, Ultra-Boy took a cover identity as a student there, using the alias “Gary Crane”. Marla pretended to be his father, “Ben Crane”. 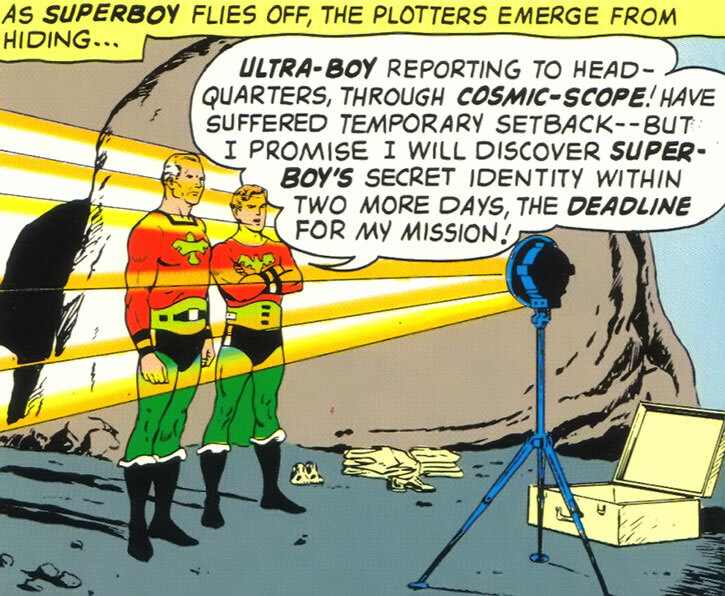 Ultra-Boy’s strategy was to ask students he met if they knew Superboy’s true identity, using his Penetra-Vision to watch for telltale signs of nervousness or excitement. 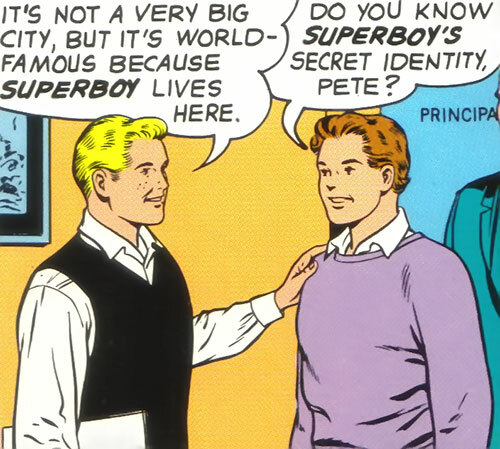 The first student he met was Pete Ross, who in fact did secretly know Superboy’s true identity. Seeing Pete’s heart start beating faster with agitation, Ultra-Boy immediately suspected Pete of being Superboy. Ultra-Boy began to tail Pete, and in the process saved Ross from a thief so he wouldn’t be “unmasked” as Superboy. But the next day Ultra-Boy observed Pete and Superboy together. He realized he was wrong about Superboy’s identity. While Ultra-Boy and Marla reported this setback, they were spotted by Krypto the Superdog. When Krypto saw them hiding costumes under civilian clothes, he thought they might be bad guys out to hurt his master. The Superdog attacked but Ultra-Boy drove him off with a burst of heat from his Penetra-Vision. 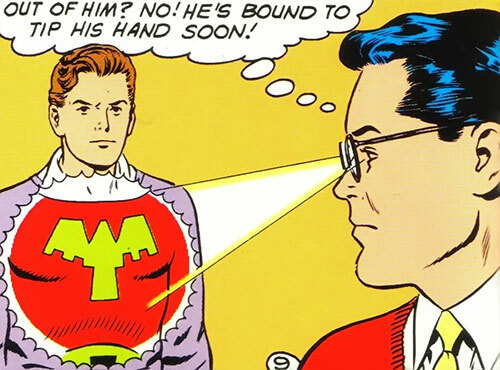 The next day, disguised again as Gary Crane, Ultra-Boy saw Clark Kent being bullied by other Smallville High students. 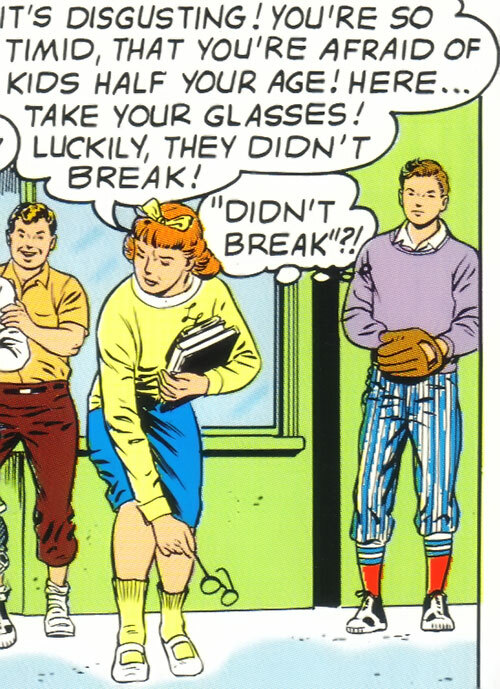 When Clark’s glasses “luckily” didn’t break, Ultra-Boy realized the glasses could be from Krypton, and thus invulnerable. He also deduced that pretending to be a meek, easily bullied student would be a perfect way to keep people from guessing that you were actually Superboy. 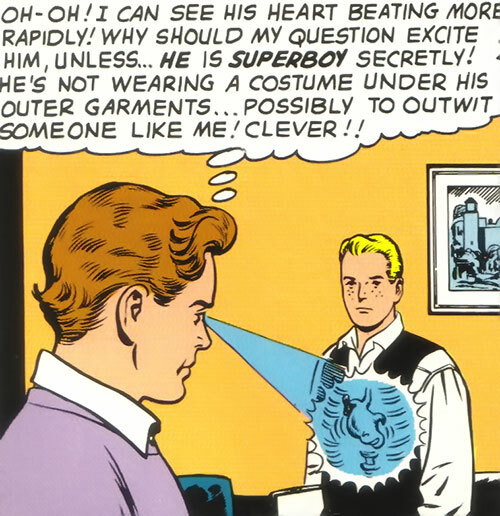 Using his Penetra-Vision, Ultra-Boy spotted Superboy’s costume under Clark Kent’s shirt, and knew he’d accomplished his mission. Going to Marla with the good news, the two prepared to go back to the future. But before they left, Ultra-Boy’s Penetra-Vision showed him that Pete Ross was in trouble again. Pete had gone to a Smallville Bank to put his diary, where he’d recorded Superboy’s true identity, in a safe deposit box. Pete was accidentally locked in the vault when the bank manager had a heart attack and collapsed. No one else knew the combination to open the vault, which was airtight and equipped with a bomb to prevent tampering. The vault door was also lined with lead. Superboy was on the scene, but because the lead blocked his X-Ray Vision, he was having trouble opening the vault door safely and rescuing Pete. Ultra-Boy went to help. 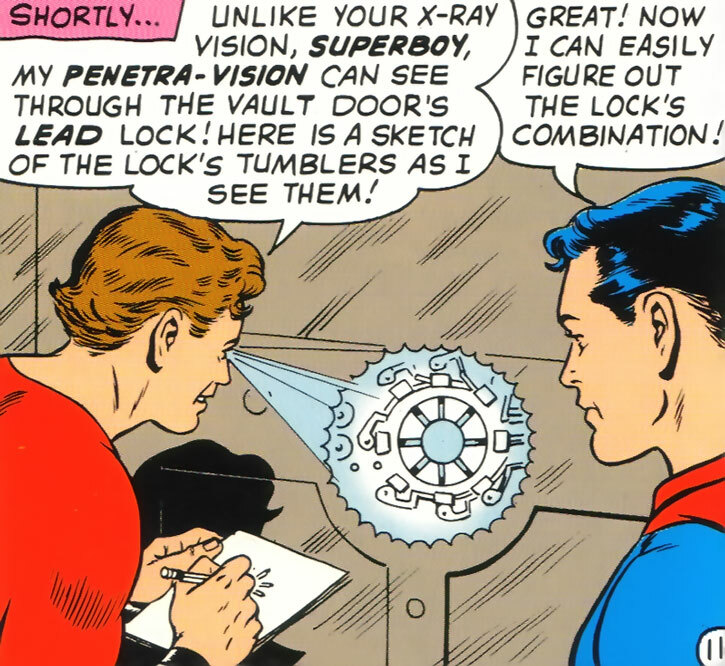 Using his Penetra-Vision, he sketched the inner workings of the vault’s lock for Superboy, who was then able to figure out the combination and free Pete safely. Ultra-Boy revealed to Superboy his true identity and mission. The two exchanged best wishes as Marla revealed that Ultra-Boy had passed his test before the deadline and was now a full-fledged Legionnaire. But Ultra-Boy’s curiosity got the best of him, and he decided to check out why Pete Ross needed a safety deposit box. Using Penetra-Vision, he read Pete’s diary. He learned that Pete also knew that Clark Kent was Superboy, and that Pete hadn’t told anyone, not even Superboy himself. Ultra-Boy and Marla praised Pete for being such a good friend to Superboy and keeping the secret so carefully. They invited him to be an honored guest at a future LSH meeting as a reward. 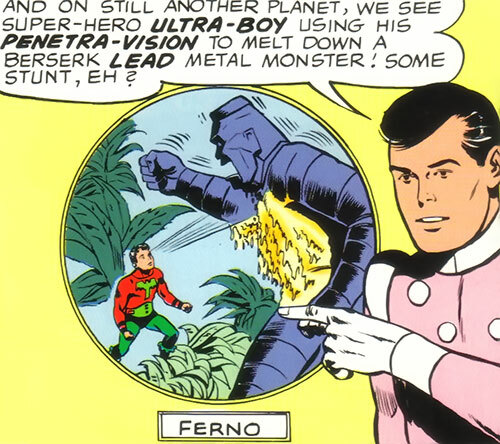 As a Legionnaire, Ultra-Boy was sent on at least one solo mission, melting down a berserk lead metal monster on the planet Ferno. 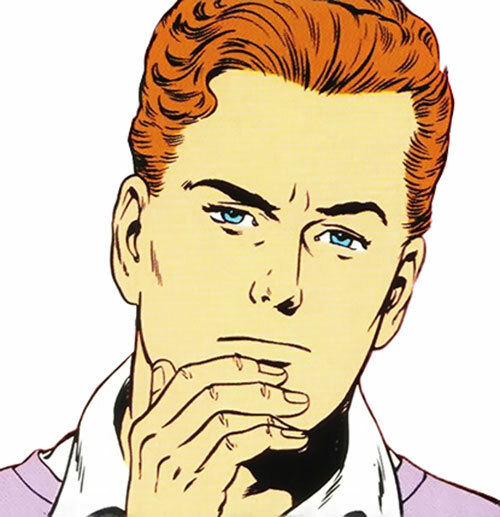 He also continued to associate regularly with both Superboy and Pete Ross. On one occasion, Superboy invited him to come into the past and attend Pete’s surprise birthday party. On another occasion, Ultra-Boy helped Pete cover for Superboy’s absence while Superboy was in the future on a Legion mission. Ultra-Boy was temporarily suspended from duty by new Legion Leader Saturn Girl using a technicality. This was part of Saturn Girl’s plot to make sure that no Legionnaire but herself would have to face the threat of Zaryan the Conqueror. Following Zaryan’s defeat (in which Lightning Lad, defying Saturn Girl’s orders, was killed), Ultra-Boy resumed his membership in good standing. Ultra-Boy is a fit, athletic, clean-cut young man with brown hair and eyes. He wears a red, long-sleeve shirt and dark green pants. His briefs and boots are a glossy black, and he has two black stripes at his wrist which give the impression of cuffs. His buccaneer style boots have a red fringe. He also wears a light green cummerbund and has a chest symbol, also in light green, which is a stylized representation of the ultra-energy beast which gave him his powers. Overall his costume is a bizarre mishmash of elements that somehow still works. Ultra-Boy is confident, maybe even cocky. He’s proud of his “amazing power” and that he can do things even Superboy can’t, and he has no qualms about going on solo missions. Beyond that, he seems affable, out-going, and friendly. He’s definitely heroic, and using his powers for personal gain was never even a question. But on the other hand, he’s none too scrupulous about using his Penetra-Vision to find out what he wants to know. This is true whether it’s to fulfill a mission or just to satisfy curiosity, as when he decided to read Pete Ross’s diary. Of course, once he’d read the diary, he went out of his way to befriend Pete and make sure Pete got lots of special treatment for being such a good friend to Superboy. In fact he seems to have quickly developed close friendships with both Pete and Superboy. As noted several times above, this is the first version of Ultra-Boy from his earliest DC appearances. He quickly evolved into a character with full one-at-a-time Superboy-type powers. That version of Ultra Boy will have two writeups, one presenting him as he was during the Silver Age and one for the Bronze Age. There is a separate writeup on WORG, written by Danielle Mendus, for Ultra Boy in the rebooted Legion published between 1995 and 2004. Ultra-Boy’s Telescopic Vision in this period is only verified at 12 APs, but 40 is likely. He also probably has Microscopic Vision and Ultra Vision at 10 or 15 APs, though the Ultra Vision would be limited to seeing in the dark. See the Powers and Abilities section below for details. Empathy is Derived from X-Ray Vision (-1). Since it works by spotting physical signs of agitation (generally, using Penetra-Vision to see a heart start beating faster), it’s limited to emotions that cause that reaction (fear, agitation, excitement, etc. ), and is only usable on people with human or very near-human physiologies (-1). X-Ray Vision is generally supposed to have a common substance that it can’t see through, according to the description in the Rules; Ultra-Boy’s has no such Limitation, which could be considered a Bonus (+1). See the Powers and Abilities section for more information. X-Ray Vision can fog and ruin old-school film negatives — no points for this since it’s a very minor effect, especially in his own time period (or in ours!). LSH (High), Pete Ross (High), Superboy (High), Marla (Low). LSH FLYING BELT or Jet Pack (see the Legion Equipment writeup for details). This earliest version of Ultra-Boy had few appearances, most of them brief. That requires a fair bit of speculation in the stats. Rather than worry overly much about it, I’ve used generic Silver Age super-hero stats. All the male Legionnaires are fairly interchangeable during this period, apart from their powers. While not quite at the level of cinematic action heroes, they’re two-fisted scientific adventurers with stats similar to what I’ve listed above. Source of Character: Adventure Comics (DCU). Helper(s): The Silver Age Legion site (now defunct but accessible through the Wayback Machine), Dr. Peter S. Piispanen, Unicorn Epiphany, Darci. Writeup completed on the 1st of June, 2014.